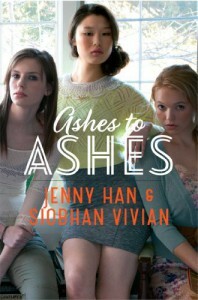 Jenny Han and Siobhan Vivian’s Burn for Burn was one of the first books that I’d read all the way back in 2014 when I’d first started out on Goodreads. What I thought was a strong and fast-paced first book just made me disappointed by the second one. I’d said that I’d finish the last book more than a year ago, but I think I’d just been drawn to other books at that time and have finished more than 10 series at this point. To be honest, I don’t know if I should’ve even read this book, I had to go online and find out what had happened in the first two books and while reading this third one, I just didn’t like the direction this series was going in. I think from the first book, I was expecting a Pretty Little Liars type of book, but this book seemed to become a paranormal chase by the time I reached this book and reading this just seemed… a bit like a chore. There was a change if heart that happened too which and the wrap-up for the characters is completely a jet- down. Especially with Lila and Reeve and the after math of all these characters. Just… no.